Kansas City’s unemployment rate for May stands at 6.5 percent according to data released by the Bureau of Labor Statistics this morning. This represents a seasonally unadjusted figure and it remains unchanged from one year ago. Our unemployment rate remains below the national rate (7.3 percent) but the gap is narrowing. In May 2012, Kansas City’s unemployment rate was 1.4 percentage points lower than the nation’s (6.5 percent to 7.9 percent respectively). 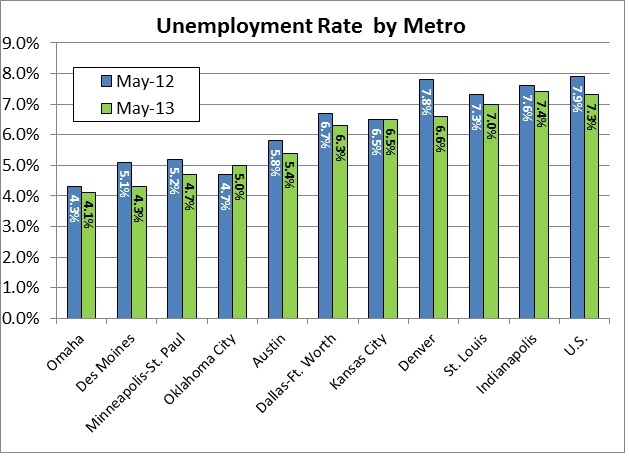 The chart below compares Kansas City’s rate to that of some peer metros. Kansas City is on the upper half of the list, with only three of the nine peers having higher rates. But the bigger concern is that all of the peer metros, with the exception of Oklahoma City, saw their unemployment rates decline over the past year while Kansas City’s remained steady. We will dive further into this data in the next issue of our monthly Regional Workforce Intelligence Network newsletter.